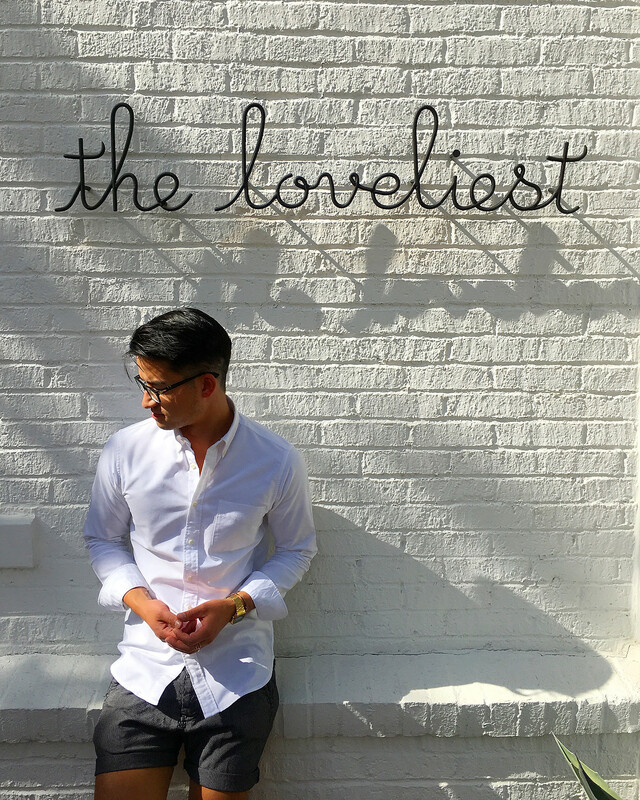 We are thrilled to have one of our favorite bloggers featured on our blog – Hello Francois! We had an opportunity to work with Francois last year and fell in love with his sense of style and great taste. We wanted to share one of our favorite posts from his blog. Francois shares his 10 tips for getting a bathroom ready for guests and we love them so much we feel they’re share-worthy! Whether I hold a big party or just an intimate dinner at home, I always want the apartment to look perfect. According to me, every single room, and even corner, should look amazing. When it comes to the bathroom, perfection and amazingness should reach 150%, at least! 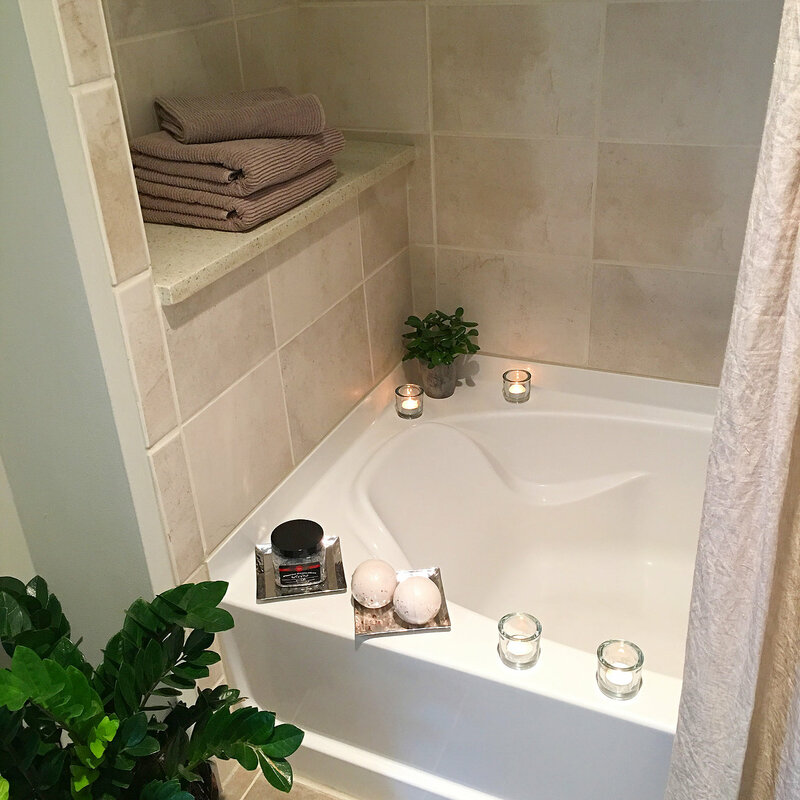 This is what this post is about, and I’m very excited to share with you guys the 10 things I do to the bathroom before receiving anyone at home! This includes obviously the sink and the floors, but also the tiles on the wall, mirrors, and shower/bathtub. I know your friends are not going to go take a bath in the middle of the party (well, it actually depends on the kind of party you’re holding! ), but they will see, for sure, if the tub and/or shower are dirty, and trust me, you don’t want that. Also, empty the trash can. It seems obvious. If you have a bathtub, elegantly display some bath bombs and bath soak, and lighten up some candles. If you have a shower, stage some nice shampoo and shower gel containers, and hide anything from razors to shower gloves. In other words, create a spa atmosphere, and show your guests how relaxing it is to take a bath or shower in your home. Use plain white toilet paper, ONLY! Also, make sure you have some spare rolls available somewhere in the bathroom, preferably under the sink, as it’s where most people will naturally go look for them. We all have that friend who is going to be curious and open your cabinets to see what you have in there. I’m one of them. Shame on me. They are much more hygienic than the regular bath towel. And if you want to reach a top of the top level, you can have them personalized. I order mine at The Stationery Studio and it’s super easy. 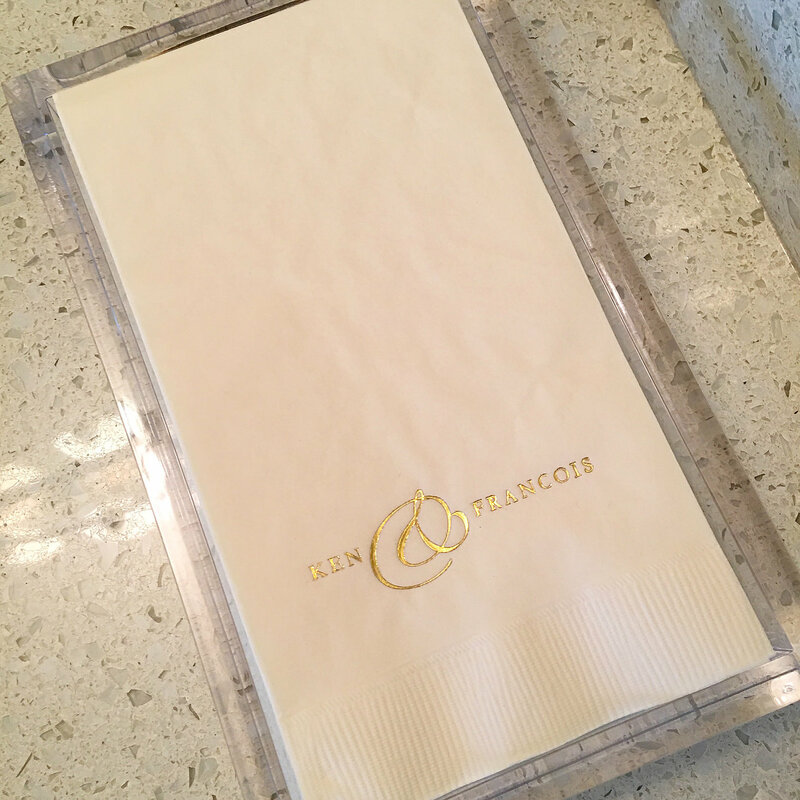 To give you an idea of the pricing, you will pay about $50 for 100 personalized Elegant Ampersand paper hand towels in ivory color with the writing in gold metallic foil, shipping included. Only use liquid hand soap. It’s much more hygienic than the regular bar soap. To be over the top, you can also have a container of hand cream available for guests to use. The container of hand cream must match the one of hand soap. Obs! It looks great and it will also show your guests how well-travelled you are, and if they are all from the Ritz-Carlton and the W hotels, it’s even better. 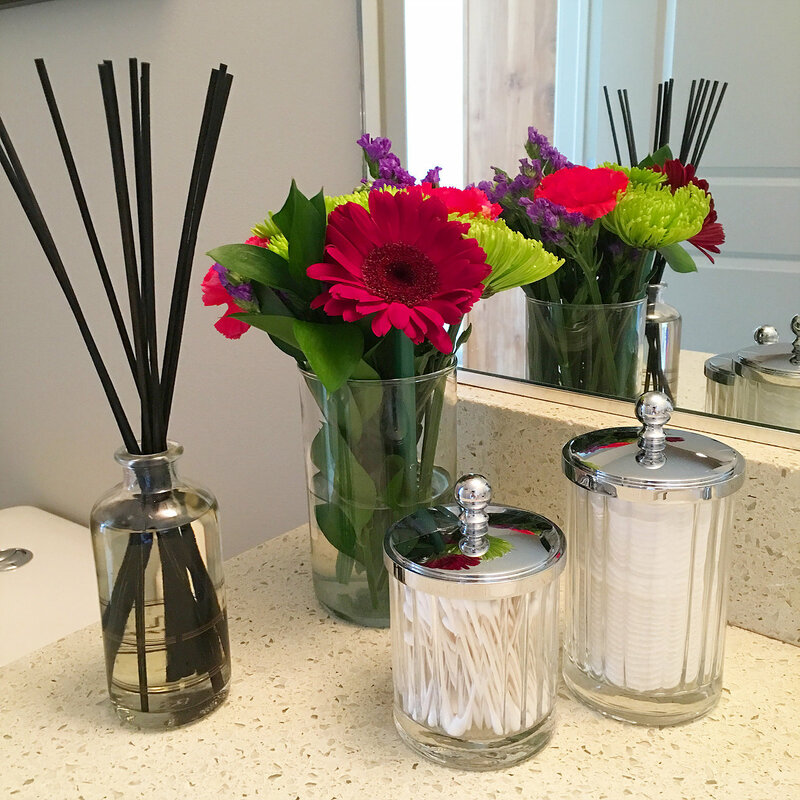 When it comes to bathroom decor, I try to make it functional and pretty. Fresh flowers are everything. Fake flowers are a big no no, even if they look super real. Some people like to touch the petals when in doubt. They will be very disappointed if they realize they are fake. It will create a relaxing and warm atmosphere. It’s always nice to go to a bathroom that smells good. It will also make your guests more comfortable to do whatever they need to do in the bathroom! Pictures and blog post used with permission from Hello Francois.